Classy camera phones for every need and budget – whether you're a pro who needs the very best, or a casual snapper on a budget. In an age where where the best camera phones can compete with the standalone cameras we once relied on so much, choosing a phone with a top-notch camera is a smart choice. Getting hold of one of the best camera phones on the market takes away the pressure of lugging a DSLR with you, allowing you to produce professional shots, video footage of a ridiculously high standard and even take photos in the dead of night. So whether your a professional photographer needing to photo ready at any given second, a designer who's decided that one of the best cameras is no longer what you need for your purposes or just a amateur photographer wanting to boost your skills then it makes sense to grab the best camera phone you can afford. Right now, the best camera phone is the Google Pixel 3. We think it's the best smartphone with a camera you can choose thanks to its incredible main sensor and superb software. You can read more about our number one choice below. But that doesn't mean you have no other choices. With the likes of the brand new Huawei P30 Pro offering camera quality to match Google and Samsung's newest devices pushing camera quality higher - there is a lot of options. So what features and specs should you look for while choosing the best camera phone for your budget? Doing a quick megapixels count is a good start, but – depending on your photography expertise – you may also want the functionality to change aperture speeds or mess with different settings. Our pick, the Google Pixel 3 makes photography easier for amateurs while still offering high-specs. When Google relaunched its mobile phones under the Pixel moniker, it was clear that much of their focus (if you'll forgive the pun) was on the quality of the onboard cameras. Quite simply, camera phones don't come any better than the Google Pixel 3. Don't let the solo sensor fool you into thinking you'll be short changed by the main rear camera – the photos it can take are nothing less than jaw dropping. In fact, none of the specs are exactly ground breaking (12.2Mp, f/1.8 aperture), but trust us when we tell you that we've never seen sharper, brighter more detailed images from any other camera phone. We're not saying it makes standalone cameras defunct, but unless you're a professional photographer, you won't need much more than what this smartphone will give you. Of course, with the phone comes Google's integrated ecosystem. Now that may be a plus or a minus, depending on your perspective. But if you're already enveloped in Gmail, Google Photos and the rest, then it makes sense to go for the Pixel 3 as well. Frankly, the Huawei P20 Pro took us rather by surprise when it launched in the spring of last year. It's proving to be the smartphone that's breaking the Samsung and Apple duopoly on the world phone market – and one of the headline features that has made it so popular is the incredible triple camera (yes, triple!) that you get on the rear of the handset. The combination of 40MP, 20MP and 8MP shooters combines powerfully with excellent image processing, noise reduction and super zoom features making the P20 Pro's overall photo taking prowess something very special indeed. And the thing that may make you go for this instead of the Pixel 3? The price: P20 Pro deals are generally cheaper than on the Google smartphone. Samsung Galaxy smartphones are now so good that the latest iterations generally struggle to make strides on the last. 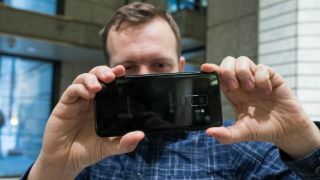 But camera quality is the exception to that rule, and Samsung's big-screen 2018 flagship Galaxy S9 Plus raised the bar again for camera phones on release. The dual 12MP cameras on the rear are the obvious place to start. They're no longer unique, but the remarkable f/1.5 aperture is, meaning you can take eye-popping shots even in low light. And you can tweak the aperture to the other end of the spectrum in sunnier climes. Samsung has also worked hard reduce noise, too. We love the super slow motion 960fps function for getting creative with videos and the bokeh-enable selfie snapper is impressive as well. Sorry folks. The cruel reality is that if you want the best camera possible on an iPhone, you're going to have to splash the cash on Apple's devilishly expensive iPhone XS. Yep, it shouldn't come as any surprise that the finest of Apple's snappers is hosted by its greatest handset. We're talking about dual 12MP sensors on the rear (one for telephoto and both with astute optical image stabilisation) and a 7MP TrueDepth camera on the front in case dazzling selfies are what you need for your business or leisure pursuits. Low light shots are much better than on other iPhones, and we really admire the generally faster focusing and natural colours. And the addition of Smart HDR means you can take better shots even quicker. Don't fancy parting with all that cash for an iPhone X model? We can't say we blame you. You can shave a significant amount off the cost or monthly bills by going for the iPhone 8 instead. It builds on the brilliance of the iPhone 7's camera – so the 12MP main sensor, f/1.8 aperture, a 5X digital zoom and optical image stabilization are all present here – and then adds some handy features, such as 4K video shooting and 240fps slow motion recording at Full HD. As ever with the iOS camera app, the iPhone 8 is devilishly easy to use as a camera and ensure that you get the best of the images you snap. We effused about its successor above, but in many ways the Google Pixel 2 is even more tempting. That's because it offers a similarly great camera but at a much more attractive price. The f/1.8 aperture on that 12.2MP main camera means that you'll get splendid results in normal and low light – much better than we found on some of the Pixel 2's 2017 contemporaries. If you want to improve your Insta-game, then you're probably not after the priciest smartphone on the market. That's why we've picked out the still-great-after-all-this-time Samsung Galaxy S8 as our choice camera phone for selfies. With its dedicated selfie mode, the S8 just makes taking photos with the 8MP front camera ridiculously easy. We found that you don't have to mess around taking multiple shots before this phone gets things right – it's on the ball straight away. The fact that it's a former Samsung flagship phone means you get the rest of the package, too: superb screen, premium design, equally impressive main camera. And as it was released two years ago, you get an affordable price tag. Wileyfox may not be a manufacturer that you immediately recognise the name of, but its been on our radar for a while thanks to its conveyor belt of robustly made, affordable mobile phones. At the price, the Wileyfox Swift 2 Plus was never going to give you stunning shots in low light and tons of features. But you still get a 16MP camera and a 3L8 sensor shipped in from Samsung. This results in photos that are superior to the usual washed out, flat fare found in the albums of most cheap phones. Instead, the images produced by the Swift 2 Plus have rich colours and fine detail. Even the autofocus holds its own. This is easily the best cheap camera around. Ok, so the main reason why we've included the Moto G6 in this list is because we can't think of a better overall smartphone with a camera that you can currently buy for around the $200/£200-mark. It's an exceptional phone that seems even better when you see the price tag. But a big part of that is the camera. Somehow Motorola has been able to afford a dual camera set-up on the rear, with a 12MP and 5MP tag-team. The result? An auto mode that makes taking beautiful pictures really straightforward, and a genuinely useful portrait mode (if that's of use to you). The 8MP selfie snapper on the front is passable, but wouldn't be adequate for the needs of Kim Kardashian and the like. Honor phones seem to get better and better every year, and its latest - the Honor View 20 - continues that trend. The handset's design leads the way where other manufacturers are bound to follow and the cameras are the features that exemplify that the most. For starters, get a load of that 48MP (yes, 48MP!) rear camera, making it the world's first mobile to boast such dizzying specs. The result is a camera and technology that's brilliant enough stabilise what it captures for fantastic images in most conditions. Equally unusual is the 25MP punch hole selfie camera which is actually a sensor within the screen rather than a physical lens - so you can wave goodbye to the notch.